We are pleased to announce an exciting weekend of events in conjunction withShane Watts and WEXCR Visit us at Appalachian Offroad MC on Friday Aug 23 for a series of seminars by AOMC sponsored riders Shane Watts and Stephen Thaxton from Worldwide Chiropractic & Sports Medicine Get a look into what a Dirtwise school is all about during a special open session with offroad legend Shane Watts! Visit AOMC on Saturday Aug 24 for an open house & demo ride day followed by a bon-fire party! Finally on Sunday Aug 25 we head to the WEXCR race in Kenna, WV to show off our new offroad racing skills! Learn something Friday, practice it on Saturday and race with us on Sunday! A one of a kind partnership, Ogio and Red Bull have teamed up to produce the Red Bull Signature Series Bag Collection. Completed in brushed gray, blue and red highlights, these limited edition bags are made to not only stand out everywhere you go but to give you the absolute finest way to haul your gear and possessions. Click here to see the entire collection. This limited edition product from Ogio is scheduled for delivery on September 1st. The Red Bull Signature Series is extremely limited and will sell out! Pre order yours today to guarantee delivery! 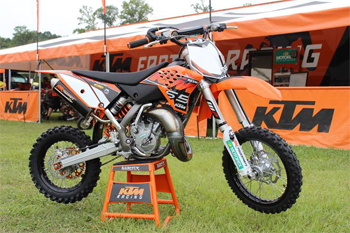 KTM riders won all three Junior World Championship titles on Sunday at the tenth edition of the FIM Junior Motocross World Championships held in Jinin, Czech Republic. Young American Aiden Tijero picked up the 65 cc title Championship, the British rider Conrad Mewse won the middle class 85 cc titles and the Latvian Pauls Jonass was the winner in the 125 cc class. 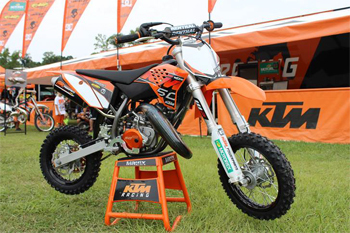 With only one exception, every young rider in the smallest category was on the start on a KTM 65 SX machine. 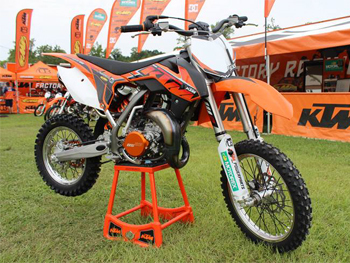 Young American Aiden Tijero, the winner in the 65 cc class at the famous Loretta Lynn meet for amateur riders in the USA took the title with the fourth fastest qualification time and with a 1-2 result in the two motos. The 85 cc class was the one most hotly contested. Conrad Mewse was the third fastest qualifier on his KTM 85 SX and won the title by a single point after delivering a consistent second place in both races. In the 125 two-strokes it was the 2011 85 cc World Champion Pauls Jonass from Latvia who took his second Junior World title on the KTM 125 SX after finishing fourth in the qualification and with a 1-2 result in the two motos. 261 riders from 39 countries and five continents came to Jinin for the championships. Of these 120 of the best qualified to contest the three different classes. Forty riders were in the start gates for the two motos that made up each class. Thanks for reading! Use Newsletter Coupon Code: NEWS082013 during checkout to save an extra 5% on your next KTM parts & accessory order at ktm-parts.com! Hurry! Coupon expires on Sept 9th, 2013.